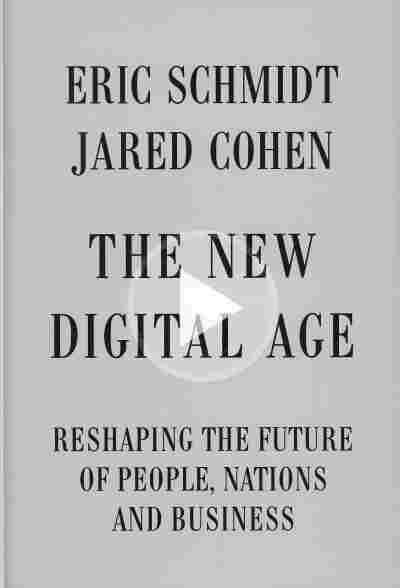 Interview: Eric Schmidt And Jared Cohen, Authors Of 'The New Digital Age' : All Tech Considered Is it naive to believe that improved Internet access can help open up truly autocratic regimes like North Korea? Google executives Eric Schmidt and Jared Cohen, authors of The New Digital Age, say the power of information is underrated. Eric Schmidt, the executive chairman of Google (third from left), and former New Mexico Gov. 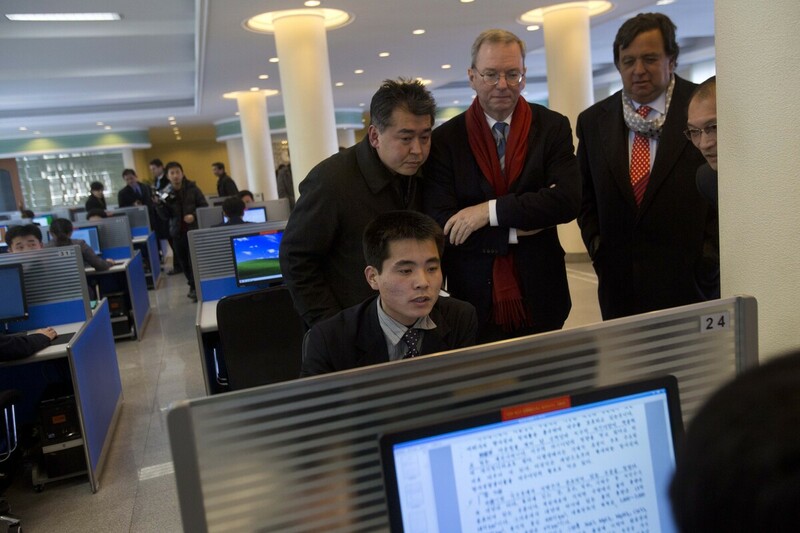 Bill Richardson (second from right) watch as a North Korean student surfs the Internet. Schmidt and Richardson visited this computer lab during a tour of Kim Il Sung University in Pyongyang, North Korea, in January. Google executives Eric Schmidt and Jared Cohen — coauthors of a new book, The New Digital Age — recently returned from a highly publicized trip to North Korea. In the second part of their conversation with NPR's Audie Cornish, they discuss the role of the Internet in more repressive countries. "We fear that the natural action for, in particular, autocratic governments experiencing what we describe as 'virtual urbanization' will be to balkanize the Internet," says Cohen, "filtering out content so that way the Internet experience in that particular country looks as much like the physical society as possible." Schmidt: "We were just in Burma. Burma of course is magically coming out of a very, very tight dictatorship and police state. As the lid of security lifts off, the underlying religious tensions are becoming well-known, and there have been attacks between Muslims and other groups and so forth, and the Buddhists. So when all that happens, the instinct is to go shut down everything, shut down the conversation, shut down the Internet." Cohen: "You have less than 1 percent of a country that's connected to the Internet, and yet every single person you talk to has heard of it. What we realize is in a lot of these societies that are beginning to connect to the Internet, this whole concept of cyberspace has come to serve in some respects a global version of the American dream. They think it's going to make them economically better off; they think it's going to make them more free. And the notion of the Internet as an idea that populations that aren't even connected are trying to pursue is in fact a very powerful one." Schmidt: "The power of information is underrated. When we went to North Korea, we felt that if there was any way we could help get that country on the right track, [it] would be to get a little bit of Internet into the country. In many countries, the Internet is the only way to get an alternative point of view in, and the Internet's arrival could destabilize some of these autocratic regimes, who we believe will fight it. They can't completely shut it off, because the Internet is too important for their business and their other goals, so a little bit of Internet in there will bring some openness and some ideas to every single country. "Countries that have the Internet already are not going to turn it off. And so the power of freedom, the power of ideas will spread, and it will change those societies in very dramatic ways. North Korea is the last stop. It's the one country that's never had the Internet, where it's been blocked — in my view, very harshly — by the government. All they have to do is turn it on a little bit, and they can't turn it back. Once the ideas are in, you cannot kick them out of the country." Schmidt: "The North Koreans, when you meet with them, are very opaque. They spend five to 10 minutes giving a speech which references the Respected Leader, many many times. Everyone writes down what everybody says. We would then give our report, and they would write it all down, and then they would not comment on it. It was impossible for us to determine whether they're really going to act on our input or not, but we tried. "We know they heard our arguments for the benefit of an open Internet. ... We have no sense of whether they're going to act on it. For example, after we left, they turned on 3G roaming for international visitors, and then two weeks ago they turned it back off again. So we don't know what they're up to. And I would caution against speculating against a country that's very very hard to read." On the role of the Internet in sustaining the Arab Spring — are digital revolutions easy to start, but hard to finish? Cohen: "Yes, and there are several reasons for that. One is, the accelerated pace of movement-making may actually stifle leadership development. So if you think about the old model, a leader took several decades — if you look at the Mandelas and the Lech Walesas of the world, they became a leader first and eventually emerged as a public figure. These revolutions now happen so fast that they're producing an abundance of celebrities, but those individuals, while well-known, don't necessarily have the leadership training. They're not necessarily able to run for office, win, and then deliver. And I guess our argument is, technology can be useful for getting into the street, which is a tactic, but at the end of the day, no revolution can succeed without having new leaders, new faces, and institutions that can deliver in a way that is better than the previous government. "Our prediction is that 10 years from now, a new generation of leaders will emerge in the Arab Spring countries, and people will actually go back through the footage to the days of the Arab Spring, and compare and contrast which leaders have emerged and what their Arab Spring credentials look like." Schmidt: "Well, what happened with China was that the censorship regime became too hot for us to handle. ... The moment anything happened in their country, we would get a phone call: delete it, delete it, delete it, without telling anyone. And it became just too much. We in fact moved over to Hong Kong, and the Chinese have built a censorship thing called the Great Firewall which controls what access gets into China. Google as a company cannot be in the middle of that kind of dynamic censorship, and that was the right decision for Google." Cohen: "If you think about the next 5 billion people connecting to the Internet, the vast majority of those populations live in parts of the world where there's conflict, instability, and where the governance model is autocracy. So the challenge is that the next 5 billion users we'll encounter, in a lot of respects, look different from ... the first 2 billion users. We write in the book that there's a dangerous gap that exists between the technical world and the geopolitical world, and ultimately over time, we want to see that gap closed." Schmidt: "With this empowerment that we talk about in the book, you have sort of a race ... of a new generation of people who will be heard from, who want to be famous, who want to be driving. The same race occurs for companies; there will be huge new platforms created on top of this global Internet that we talk about, and there will be a new generation of companies like Google, Twitter, Facebook, and so forth, all of which will be competing, and they'll be competing very fast. It's true that governments always have the security trump card eventually, but the movement of the people in the company is so fast-forward, we'll change the governments faster than they expect. And in many cases they'll be caught flat-footed, and in countries where there is not a sense of democracy, it's not an elected government, there's a serious danger of overreaction by autocrats as a result of this."